National monuments are under attack as they've never been before. And in the midst of the Trump administration's onslaught against some of our most precious existing monuments, a hostile Congress may soon seek changes to the law that would curtail or eliminate presidential authority to designate new national monuments. President Trump has just announced he's slashing Utah's Grand Staircase-Escalante National Monument in half and cutting the area of Bears Ears National Monument by 85 percent. These cuts are the largest-ever reductions to our public lands made by any administration in U.S. history. And dozens more monuments are on the chopping block. Within hours of Trump's proclamation slashing Grand Staircase-Escalante, the Center and allies filed suit, and we sued over Bears Ears the same week. But we all need to take action, on the streets and in the courts, to save our public lands. Trump has launched an unprecedented attack on our national monuments. Take our pledge to resist. 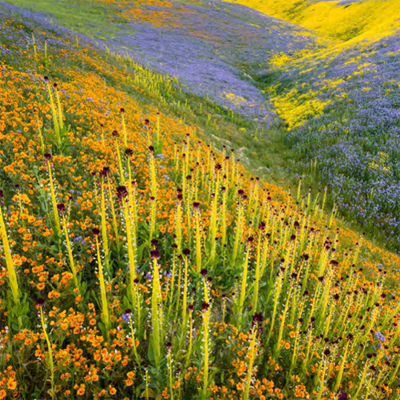 Carrizo Plain National Monument. Photo by Michael Frye. In spring 2017, President Trump signed Executive Order 13792, directing the Interior Department to review every monument designated since 1996 that 's larger than 100,000 acres , as well as any monument the secretary deemed should be reviewed. Under the terms of the order, 27 national monuments were reviewed. On May 5 Interior started a public comment process on the 27 national monuments. Zinke visited a handful of national monuments and met almost exclusively with their opponents, like representatives of the oil, gas and timber industries. Zinke submitted his report to Trump by the Aug. 24 deadline, but the report was kept secret until it was leaked to the press in September. On December 4, 2017, Trump went to Utah to announce that he's shrinking the state's Grand Staircase-Escalante National Monument in half and cutting the area of Bears Ears National Monument by 85 percent. These cuts are the largest-ever reductions to our public lands made by any administration in U.S. history. Just hours after Trump's proclamation, the Center and allies started fighting back, filing a lawsuit attacking the order shrinking Grand Staircase-Escalante as an abuse of the president’s power. But now the House is about to consider legislation to eliminate Grand Staircase-Escalante altogether, creating three smaller national monuments. Trump wants to slash more protections for many other iconic national monuments, including Cascade-Siskiyou in Oregon-California; Gold Butte in Nevada; Organ Mountains-Desert Peaks and Rio Grande del Norte in New Mexico; and Katahdin Woods and Waters in Maine. Zinke also wants to open three marine monuments to industrial commercial fishing: Northeast Canyons and Seamounts in the Atlantic; Pacific Remote Islands; and Rose Atoll in the South Pacific. In addition to removing protections, Zinke also recommends shrinking boundaries for four monuments; Bears Ears and Grand Canyon-Escalante in Utah; Gold Butte in Nevada; and Cascade Siskiyou in California and Oregon. Zinke claimed to be listening to the people, but instead he ignored more than 2.8 million people who wrote to the Interior Department, nearly all of them urging the administration to preserve protections for these iconic places. As he defends his recommendations against a groundswell of public support for national monuments, it’s clear that Zinke is putting corporate interests — including coal, oil, gas, logging and livestock grazing — ahead of the public lands and wildlife he promised to protect. For more information contact ignite@biologicaldiversity.org. George W. Bush used the Act to designate the first large marine monuments, protecting vast swaths of ocean to save marine life in coral reefs, whales, sea turtles and hundreds of species of fish. The Antiquities Act, also known as the National Monuments Act, is one of America’s oldest, most important conservation laws, allowing presidents to quickly protect natural and cultural resources on public lands when Congress fails to act in order to preserve objects of “historic and scientific importance.”  Special places and objects are protected within monument areas; they may be exempted from mining, logging or oil and gas development, though some monument designations “grandfather in” existing land uses. Legal scholars believe presidents lack the authority to reduce boundaries, or weaken protections for existing monuments. Congress has reserved these powers to itself. 1. 16 U.S.C. § 431 et. seq. 2. Rosenbaum, Robert D. March 29, 2017. "No, President Trump can’t revoke national monuments." in Washington Post. http://wapo.st/2hm4Nuk. 4. 82 Fed. Reg. 20,429 (May 1, 2017). Stand for public lands by joining Ignite Change. Learn more. Photo of Grand Staircase-Escalante National Monument courtesy BLM; photo of gray wolf courtesy Flickr/Per Harald Olsen/NTNU.